Youth issues have become political issues. Each year on Youth Day, we hear of the crisis of education and unemployment. But as politicians use the “youth” to further their campaigns to the 2014 elections, they fail to acknowledge many of the struggles young South Africans face. By GREG NICOLSON. 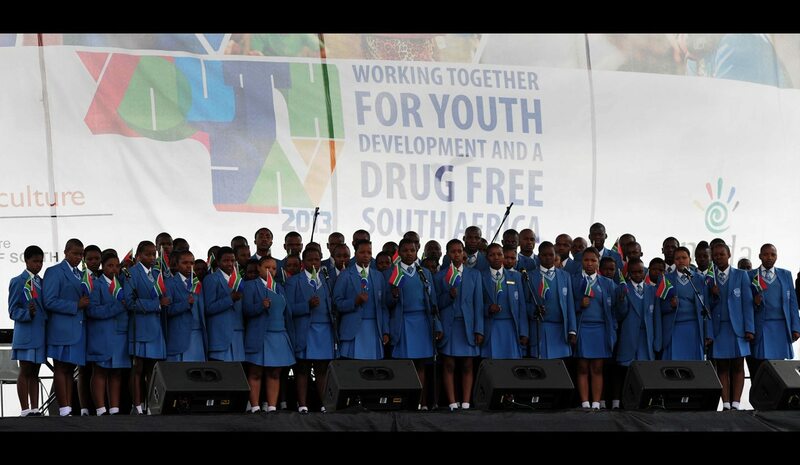 Youth Day is about struggles past and present. Speaking in Newcastle, President Jacob Zuma focused his speech on the 1976 student uprising before turning to the current challenges facing young South Africans. The common factor, he said, is the desire to have a better life. Over half of the country is under 39-years-old and 72% of unemployed South Africans are under the age of 34. According to Zuma, youth development faces several key challenges: unemployment, drug and alcohol abuse, xenophobia and access to quality education. “As youth, your task is learn, learn and learn. Learn from the lives of those before you and, most important of all, learn the skills that are necessary to build a winning nation and a non-racial, non-sexist and democratic South Africa,” advised the president. The Democratic Alliance performed a similar tune. Speaking in Johannesburg and Limpopo, party leader Helen Zille and youth leader Mbali Ntuli focused on the lack of decent education and unemployment. In a press release, Cosatu said the structure of the economy needs to change and asked young people to be responsible for their future. Newcomer to party politics, Mamphela Ramphele, criticised government for failing to improve the Apartheid state’s education model and asked young people to honour the spirit of the youth uprising of 37 years ago. Out of touch and fond of paternalism, the politicians’ speeches were framed by the upcoming elections. There was talk of what needs to be done, but little on what is – the diversity of South African youth and the varied realities of individuals. There’s a failure to recognise that youth are real people, with their many issues and with broad struggles. Judging from the Youth Day speeches, young South Africans have benefitted from the struggle against apartheid and have vast opportunities – such potential – but are crippled by challenges. It’s a neat summary, but looks at the most important group of South Africans as children rather than citizens. It uses them to get votes rather than improve communities. The definition and the way young people are treated feels glib, too dry to take seriously; young people do have lives beyond education and employment. What about those who weren’t able to finish high school and are struggling to survive in a squatter camp? How about young prisoners? Does the political narrowing of “youth” capture the 22-year-old with a part-time job who wants to party on the weekend and find a girlfriend? Does it capture the students completing a master’s degree? How about the management consultants or the young politicians? Young people do need an education and a job, but there are other struggles. Think of the high school students who can’t afford a taxi to get to school and have to support siblings. Think of the university students pressured to sleep with lecturers or those in situations of sexual violence struggling to focus on an assignment. What about the boy who wants to be a man and go to initiation school but is scared after so many of his peers died? Young people are vulnerable to many health risks. Racism and discrimination remain serious concerns. Teenage pregnancy, alcoholism and drugs are a massive threat. So is suicide. Politicians fail to recognise the many challenges that can define the lives of a diverse South African youth and yet it is the myriad of challenges that cause some of the problems they are so concerned about. Young people cut their identity in a society that continually wants to categorise them according to gender, sexuality, race, ethnicity or class, yet they are at the very heart of the project social cohesion South Africa. In the midst of such issues, youth continue living, waiting, struggling, crying, hustling, dying and even killing. While dealing with all of that, there are the ever-present dreams, ambitions and fears as they navigate an uncertain future in a society created by another generation that largely remains in control. Meanwhile, those who get a chance to speak on the issue of youth, those controlling power and discourse, continue to tell young people what to do. Be in control of your own future. Be of service to the community. Be straight. Be a good student. Be safe. Be rich. Be modest. Be entrepreneurial. Be a good husband. Be a good man. Be inclusive. Be a woman. Be harder working. Be submissive. Be strong. Be funny. Be cool. Be drug-free. There’s little space for youth to just be, to carve an identity and future of their own and have their own voices heard on the most important issues in society. As youth continue to be marginalised from discussing their own challenges, hopelessness rules. When you’ve repeatedly been promised a better future many times but have had a poor education, can’t find a job, or don’t feel your voice will be listened to, despair is a friend. Look at the struggling National Youth Development Agency and it feels like there’s little hope to give help to those who need it. It’s a dramatic narrative but doesn’t define “youth”. Young people are not a single entity of despair. Look at the Mail & Guardian’s Top 200 Youngsters released last week and you’ll find some of the most impressive young people in the world. Their lives don’t seem to be about unemployment statistics, but about opportunity, hope and hard work. Whether South Africans want to be on that list or just get a job or some help with the challenges they face, they need the space to aspire to something and have a voice on who they are and what they want.